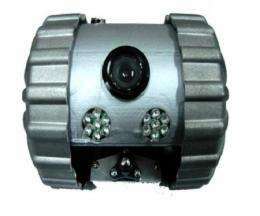 (PhysOrg.com) -- Two South Korean firms have developed mini firefighting robots to help human firefighters safely plan their course of action before entering a blazing building. Hoya Robot has developed a Firefighters Assistance Robot (dubbed a Fire Spy Robot), a remote-controlled device that can reconnoiter a burning structure, transmitting images, sounds, and data on temperature, smoke, and gas to firefighters over 50 yards away. This kind of information is vital for firefighters to ensure their safety before entering a burning structure. The little two-wheeled robot can roam through the blaze spraying water from a fire hose and looking for trapped people. Its onboard light and camera helps firefighters pin-point people before they enter the building themselves. The robot also gives them enough information to decide on the safe routes, and quickly develop a rescue plan. It is a firefighter-assisting robot, not a "Firefighting Robot". I don't think firemen are going to be sitting outside while a tiny robot tries to map an unfamiliar building. I was also initially confused about why the robot in the last video was just watching the chair burn. It would be a handy tool for arson, though.